One month ago around this date, I walked into my biggest adventure yet. Well it’s definitely tested my organisational and time management skills, that’s for sure. Every week for me looks a bit different, due to work load, work, extra activities ect… so I haven’t been able to get into a routine and I’m still whinging it a lot. Maybe that’s why I haven’t been able to blog for a while. I always thought people were being over-dramatic when it came to reading for their lectures but it is NOT A LIE. I’m lucky if I don’t have to read for a lecture but that’s very rarely the case because there’s just so much to take in, I’ve just learnt the general lesson of; There’s always something I could be reading. That’s the same for the actual work load as well. There is a constant stream of to do lists whirring through my head and being transferred to a notepad. Connecting with people has been a bit of a struggle, not going to lie. Mainly because I don’t live in halls and that’s where all the partying seems to be happening (but I am not giving up my own room for a student dorm this year)! And I also have a lot on outside of the university environment. All of the 3 societies I am apart of love to go out, which I have to be in the mood for so it’s a bit tricky. I have a couple of lovely ladies on my actual course but apart from that, I’m not as social as I thought I would be and I’ve not yet decided if this bothers me or not. I knew I needed to be intentional about making friends but quite honestly, I don’t think I realised I needed to be this intentional. Throughout the past month, I have made the decision to move out and into a student house in my 2nd year hoping that this may force me into being more social and also so I can stop commuting, utilising my time more. My only worries are that my course runs a 3 month placement from September to the end of January, meaning I have to be extra picky with who I live with. All in all, I’m still feeling my way through, trying to find my balance between life and uni life and it’s only going to get busier and harder from here on out. There’s peaks and troughs to everything in life but reassuringly, it’s still the place I know I’m meant to be. 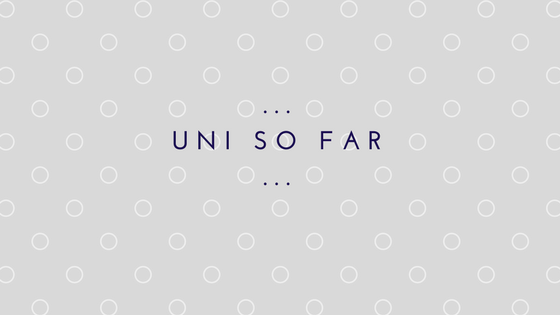 Tell me about your uni experience in the comments! Or if you have any tips, they would be more than welcome!